This book sets out to investigate the process of agrarian change from new angles and with new results. It starts on firm ground rather than from abstract economic theory. Upon its initial appearance, it was heralded as "a small masterpiece, which economic historians should read--and not simply quote"--Giovanni Frederico, Economic History Services. The Conditions of Agricultural Growth remains a breakthrough in the theory of agricultural development. In linking ethnography with economy, developmental studies reached new heights. 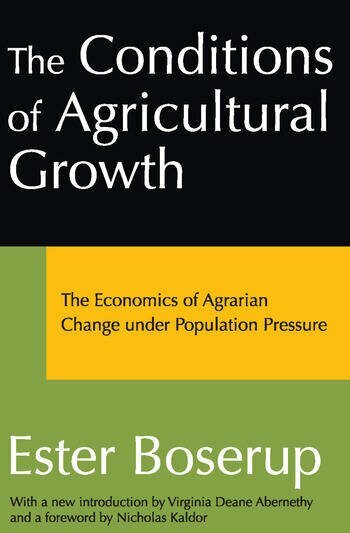 Whereas "development" had been seen previously as the transformation of traditional communities by the introduction (or imposition) of new technologies, Ester Boserup argues that changes and improvements occur from within agricultural communities, and that improvements are governed not simply by external interference, but by those communities themselves Using extensive analyses of the costs and productivity of the main systems of traditional agriculture, Ester Boserup concludes that technical, economic, and social changes are unlikely to take place unless the community concerned is exposed to the pressure of population growth.